Firefox is a very customizable browser. As well as add-ons, it has a vast number of advanced settings you can adjust via a special “about:config” page, which enable you to do all kinds of useful things, such as stopping the browser from switching into “Work Offline” mode if your Internet connection drops. But what happens if you’ve spent ages tweaking those settings to customize your browser perfectly, only to have to re-install it due to a hard drive crash, or you want to install Firefox on another machine with the same settings? A backup would be very handy. 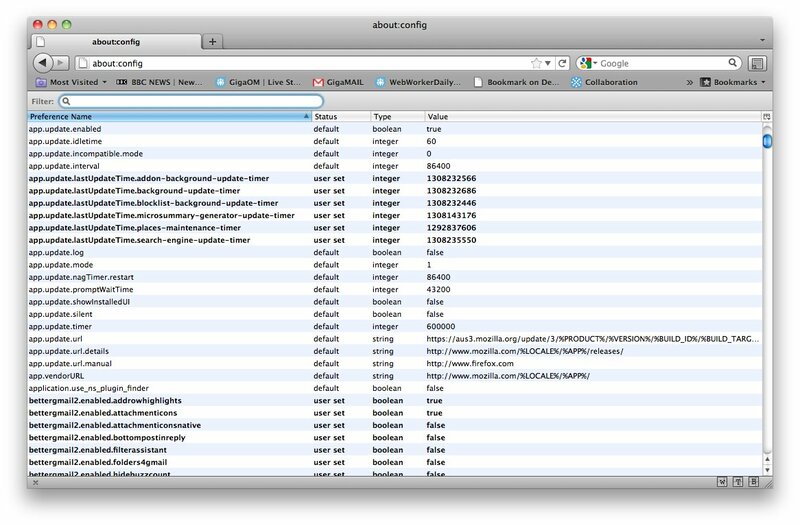 Firefox stores your about:config settings in a file called prefs.js, which is kept in your profile directory. So to back it up, all you need to do is find your prefs.js file (on my Mac (s aapl), my profile directory is stored in /Users/simon/Library/Application Support/Firefox/Profiles, while on Windows (s msft) it’s in \Users\Simon\AppData\Roaming\Mozilla\Firefox\Profiles\) and copy it to a safe location (Dropbox account, USB stick, etc.). Then if you ever need to reinstall Firefox, you can simply overwrite the prefs.js file in the profile directory with your backup. Restart Firefox and your settings will be restored. If you want to backup both add-ons and preferences, there are add-ons that can help, such as the Firefox Environment Backup Extension (FEBE), which can back up extensions, themes, bookmarks, preferences, passwords, cookies and more. You can also use Firefox’s built-in Sync tool or MozBackup (a third-party Windows (s msft) app) to back up profile data, as I detailed in this post. (Note: Be careful when fiddling with Firefox’s about:config settings. If you want to know what each setting actually does — and some of the descriptions are quite arcane — you may want to install the What’s That Preference add-on that I’ve written about previously). What’s The Preference is incomplete. Many explanations do not exist.